You are currently browsing the The Pet Product Guru blog archives for July, 2015. A few evenings ago, I was out on my deck and looked across the street and saw a fox. I know that my two cats are safe and secure inside the house but my neighbor’s cat “Henry” is an outdoor cat and roams the neighborhood in the evenings. I immediately became a little concerned being that the fox was right near where Henry usually roams. Are Cats prey to fox? The answer is usually no. They are known to take on small mouse-like rodents such as voles and ground squirrels. However, when prey is not sufficient, fox may hunt domestic cats.Generally, cats do not form an essential fox’s diet. As I always say, it’s always safer to keep your cats indoors especially at night. Great music on six great stations on THE EDGEWATER INTERNET RADO NETWORK! Great Popular standards all the time. Timeless Classics on STARLITE 365. Most dogs love the water but there are some that may not think that being in the water is so great. There are generally three categories when it comes to dogs and water. Dogs that can swim, dogs that need to be taught to swim and dogs that hate being near the water.Water spaniels, golden retrievers, Irish setters, English setters, and the water-loving Newfoundland fall into the first category — all excellent swimmers. This is mainly because of their strong limbs. 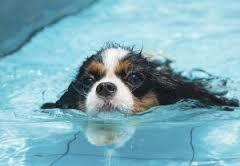 The ability to swim can also be in a dogs genes. Many were bred specifically to retrieve waterfowl or for water rescue. Each of these dogs has a strong tradition of swimming within the breed and generally enjoys being in water. There are many other breeds that love the water and also many mixed enjoy frolicking and splashing in any body of water. Try the great music on six great radio stations on the EDGEWATER INTERNET RADIO NETWORK! How do you bathe your dog? Remember that if you bathe them too often, their body overcompensates and produces too much oil resulting in a dog smell. Groom your dog regularly. This way you can tell if he has dry or oily skin. So where do you bathe your dog? This depends on its size and coat. Small dogs can be bathe in a kitchen sink. Big dogs can go in bathtubs but beware that after they get done shaking off the water, your bathroom will look like a mess. If you can, it’s best to bathe large dogs in the basement or outside. I read about a dog owner who spotted a bathtub out on the curb on garbage day and recycled it as a basement washing and grooming station for her dog. The best way to dry a dog is to towel dry him. Make sure that you have lots of towels so you’re not rubbing your wet dog with a wet towel. Some dogs like Labradors have oily coats that dry easily by towel. If you decide to use a blow dryer on your dog, make sure that it is on a low to medium setting from a distance of a few feet. There have been cases where the blow dryer was placed too close to the skin resulting in the dogs skin being burned. While I’m on the topic, make sure that you are familiar with and trust your groomer. Check out their method of grooming and drying your dog the make sure that it is safe. If there is any doubt in your mind at all, go to another groomer. It’s better to be safe than sorry. 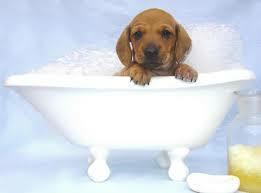 So now that your dog is clean and smells fresh, maybe you can cut back on the pet odor removal products! Keep the music playing all the time on THE EDGEWATER INTERNET RADIO NETWORK! Natural Dog health remedies has put together a list of herbs that are dangerous to your pets. Keep this list handy and refer to it when using various herbs. While this herb (and its essential oil) is an effective insecticide, it is toxic to dogs and cats at high doses. In particular, it should NEVER be used in pets with existing kidney disease. The essential oil of pennyroyal is extremely concentrated and, to be on the safe side, should not be used on dogs and cats, especially if they are pregnant. For bigger dogs, use tea tree oil with care. Always dilute the essential oil (at least 50:50) in a carrier oil (e.g. olive or almond oil). Test a small patch of skin prior to use as some pets may be sensitive to the oil. Comfrey contains small quantities of alkaloids that can cause liver damage or cancer if taken in large quantities or prolonged period of time. Therefore, if comfrey is to be used internally, use it for short periods and in moderation. Also, do not use comfrey in pregnant or lactating pets or those with pre-existing liver disease. Since the alkaloid concentration is ten times higher in the root than the leaves, DO NOT use comfrey root internally. Comfrey dried leaves, on the other hand, contains very little alkaloids so use the dried leaves if needed. White willow bark contains salicylates (same as in aspirin) which may be toxic to cats. Also, do not give this herb to your dog if he is taking NSAIDs (non-steroidal anti-inflammatory drugs). This Chinese herb is most commonly prescribed for pets with asthma or respiratory problems. However, it can cause heart arrhythmias (irregular heartbeat) and high blood pressure in animals, and some reports also state that it may cause idiosyncratic reactions in cats. Use with great caution in all pets. Wormwood is a traditional deworming herb. It is however too strong on pets, because it contains strong volatile oils, tannins, and bitter principles. If used excessively, it can irritate the liver and kidneys, and may even damage the nervous system in extreme cases. The dilemma with wormwood is, if used in small amounts, it is ineffective in deworming. If used in bigger doses, it may cause problems to our pets! Since there are other safer natural remedies for deworming, it is advisable that we use wormwood with extreme caution and only under strict holistic veterinarian advice. If used in large doses or over an extended period of time, yucca can irritate the stomach lining and intestinal mucosa, which may cause vomiting and bloating. If used in small doses, yucca is safe. Therefore, avoid giving yucca to your pets more than 4-5 times per week, more than a month or two at a time, or during pregnancy. Garlic in large amounts can cause Heinz body anemia in dogs and cats. It is not advisable therefore to use garlic in pets with anemia. However, if fed in small amount, garlic is good for many uses, including the treatment of parasites such as fleas and worms, microbial infections, and in the treatment of cancer. One clove of garlic per 10 pounds of body weight for dogs (and 1/2 clove per cat) can usually be fed safely each day. Visit our page on Garlic for Dogs for more information on this herb. Great music all the time on THE EDGEWATER INTERNT RADIO NETWORK. Yes, this does sound strange but I assure you that your dog will not be given viagra to cure his erectile dysfunction! Actually in 2008, the British Media reported that Viagra has been credited to saving the life of a three year old border collie with heart problems. The dog developed a heart condition after suffering from a lung infection. He would lose consciousness when he got excited because his blood could not pump fast enough. 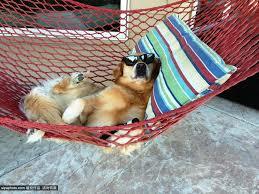 His vet warned that the dog would die from the disease and suggested Viagra as a last resort. Viagra improves blood flow to the heart. The blue pill was put in his food and it did cure his heart disease. If a dog has poor blood flow, the vet may suggest viagra as a prescribed pet medication because it does improve blood circuation. So don’t be shocked if you hear that one of your furry friends is on viagra. Don’t worry, it’s not for erectile dysfunction! Summer music, a great variety on six great stations. The EDGEWATER INTERNET RADIO NETWORK! add comment Comments Off on Viagra for Dogs?? I have talked about this many times. 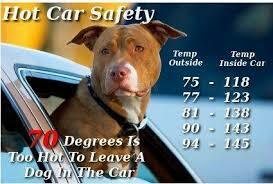 You hear stories about babies and pets being left in hot cars and put in life threatening situations everyday. They can make any excuse in the book but a, it leads to only one thought …..STUPIDITY.…….STUPIDITY and STUPIDITY!!!! It takes only minutes for a pet left in a parked car in the sun on a warm day to succumb from heatstroke or suffocation. Did you know if the temperature is 78 degrees outside and you left your car in the sun with the windows shut, that car could reach 160 degrees! Could you imagine what that would do to your pet? Even if the temperature is in the 60’s, experts recommend not to leave pets or children a car parked in the sun even for a short period of time. Rolling down the window and parking in the shade doesn’t guarantee protection for your pet if the temperature is in the 90’s. Plus, with the window rolled down, you run the risk of your pet escaping. What if you leave the air conditioner on. Here’s a true account of what can happen. In 2003, a police dog in Texas died after the air-conditioning in the patrol car shut down and began blowing hot air. The air system’s compressor kicked off because the engine got too hot. Many cars, including modern models with computerized functions, are prone to the same problem. In August 2004, a North Carolina couple lost two of their beloved dogs, and nearly lost their third dogs, as result of a similar failure. They had left bowls of water and ice in the car, and the air-conditioning on, during their shopping trip of less than 30 minutes. So what’s the answer? 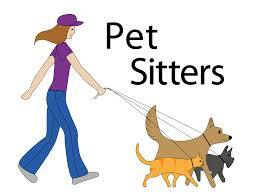 If you are traveling with a pet, it’s better to travel with more than one person. While one person go into the rest stop, the other can stay with the pets with the car on and the air conditioner running. This is what I usually do. The other option, is to travel a night when the temperature is cooler and there is no sunlight. Make sure you take the dog water bowl and stop frequently to give your dog a drink. Check out six great radio stations on THE EDGEWATER INTERNET RADIO NETWORK! This past week has been a roller coaster ride for me and my two kitties. My older cat Molly seemed to have a minor spell last Sunday and stopped eating for a day on Monday. This concerned me since she has some issues and is 16 years old. She bounced back on Tuesday and now is eating just fine. I then noticed that she stopped pooping for a few days which got me concerned once again. She seems fine now and is eating and pooping normally. Now the problem has shifted to my younger cat Millie. Millie has always been afraid of Molly. The two never bonded and Molly always showed that she was the dominant cat. Things seemed to calm down for the past few years. Until now, the rivalry has seemed to flare up again here at our house in Delaware. Millie peed on the living room rug yesterday. Cat will do this if they feel stressed out. Millie suddenly feels threatened again. Now Millie stopped pooping which is my new concern. I wish there were cat psychiatrists because my two would be in therapy for a long time! Great music, check out our six radio stations on the EDGEWATER INTERNET RADIO NETWORK! Does your cat lick until her fur falls out? If this is so, she may suffer from an inhalant allergy. Did you know that feline skin allergies are very common? Food is not the only cause. 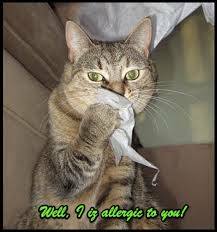 Sometimes cats are allergic to pollen, mold, mildew or other things in the air. 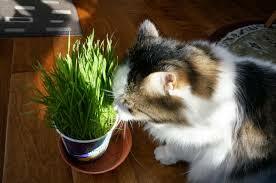 The same things that trigger hay fever in humans can make cats itch like mad. Sometimes the itchiness can be so uncomfortable for a cat that they will lick themselves until their skin is raw. This problem can be seasonal or year round. If your cat has these symptoms, take her to your vet for an accurate diagnosis. An allergy test can help determine the cause. Pet medication such as an antihistamine, allergy shot or steroid treatment is all that is needed to help solve the problem. For great alternative music, check out THUNDER ROCK 101! Normally a cat will poop once or twice a day. 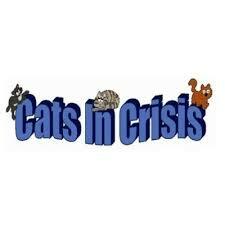 Each cat’s system is different so if you cat only poops every two days, don’t panic. This is probably normal for your cat’s digestive system. My cat’s usually will poop every day or two. If your cat has not done his business for three days or more, he could be constipated. You may want to try mixing canned pumpkin with his food. This will provide fiber and could solve the problem.Only mix pure canned pumpkin NOT pumpkin pie filling. If this doesn’t work, take him to the vet. Your vet may give him an enema to clear him out. 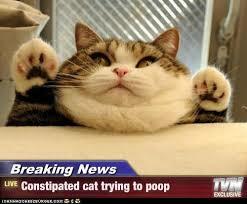 Chronic constipation could be a sign of a more serious problem that is why it’s important to get your cat checked. My older cat Mollie has been having some issues lately. A few days ago she didn’t eat for a day but is now ravenously devouring her food but it seems that she hasn’t been pooping normally. I tell you, when a cat gets older, it could be one issue after another. I did find some poop in her litter pan today but it could have been from a few days ago so I’m watching her closely. Remember, your pets count and keep an eye on your cat’s poop! American Popular Standards are alive on STARLITE 365. Check our station out today!